It’s no secret that I love all things barbecue, but let’s face it, up until the last few years the District has been devoid of some really good BBQ joints. That’s not a slight on mainstays like Rockland’s or Hill Country, they just don’t particularly move the needle for me. 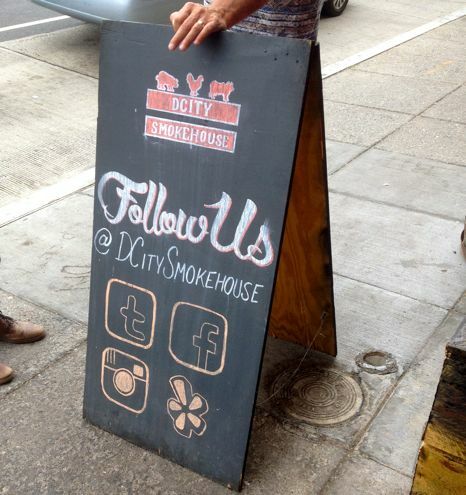 And considering that I have had some outstanding barbecue in places like Austin and Kansas City, I’ve been craving a place that can really fill that niche here in the D.C. area. (On a side note, I really need to check out KBQ in Lanham, which I still have sadly not been to and have heard wonderful things about). 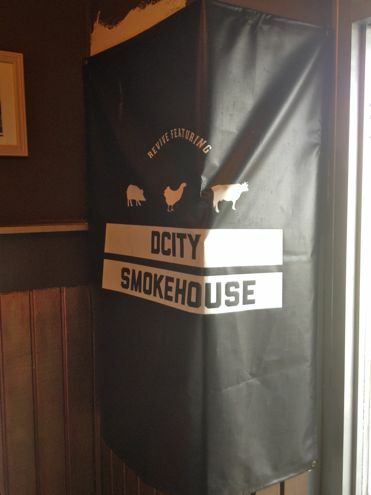 Anyway, I had recently read Tim Carman’s review of DCity Smokehouse in the Washington Post and quickly made it a priority to check out this establishment, so a coworker and I headed to NoMa during our lunch hour a few weeks ago. Firstly, this is strictly a carryout venue. Sure there are four seats nestled inside the small storefront, but chances are that they’ll be occupied given the amount of people waiting for their orders near the pickup counter. 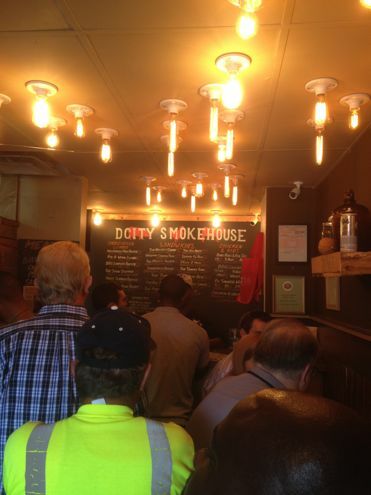 It’s hard not to fall in love with the aroma of smoke and hickory as soon as you walk in, making the choice of which of their 14 sandwiches to order from that much more difficult. 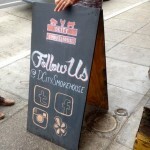 On top of that, they offer combo platters, meats by the pound, wings, and even chicken and waffles. I opted for the first sandwich listed on the menu – The Brisket Champ, because you can never go wrong with brisket when it comes to barbecue. 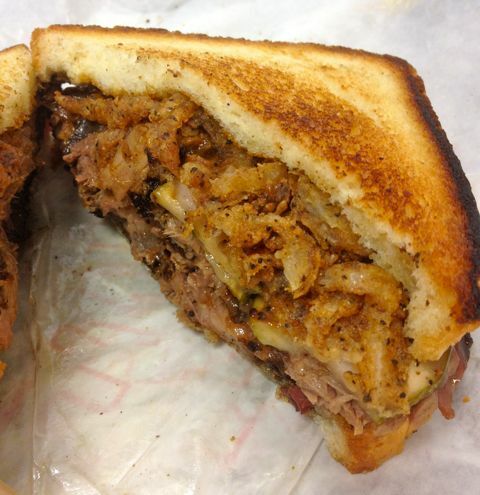 The sandwich featured generous layers of sliced brisket topped with crispy fried onions and housemade pickles, and was sandwiched together by two slices of Texas Toast. After the first bite, I had fallen in love. 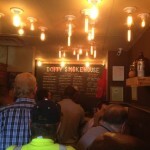 The brisket was some of the smokiest, most flavorful ‘cue I have come across in the District. 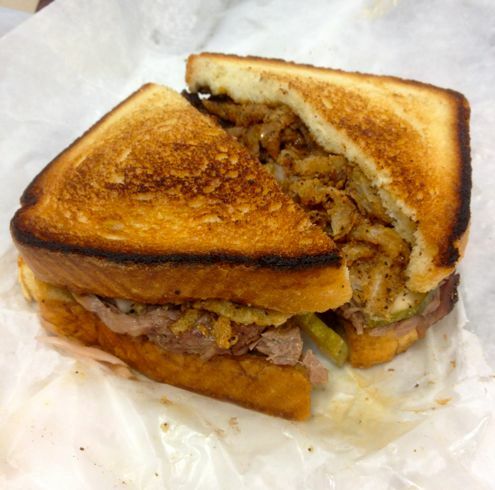 A bit fatty in places, each bite was a mouthful of succulent, tender brisket gorgeously complemented by the crispy onions and crunchy toast. And that brisket crust, my goodness. This is how brisket is done, folks. 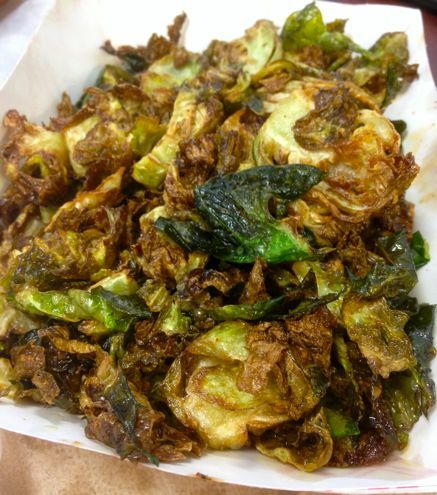 I also ordered a side of their crispy Brussels sprouts which made for a great side dish, though between the greasiness of The Brisket Champ and this, it was a little too much oil in one sitting. That’s not to say I still wouldn’t recommend them because they’re a great preparation, right up there with Red Hen’s in fact, but I would probably pair the sprouts with one of their sampler platters instead. Meanwhile my coworker was raving about their BBQ chicken but didn’t really care for the smoky brisket chili. I tried the latter, and while it sounds decadent, you’re better off just ordering the real thing instead of its soup variant. Speaking of which, you should just order it by the pound. It’s that good. 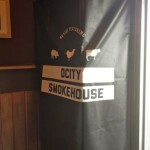 DCity Smokehouse has been only open less than a year but already features some of the best barbecue you will find in the city. My coworker and I are already debating what to order on our next visit. I’m personally eyeing the Meaty Palmer, a sandwich of smoked turkey and pork belly with smashed avocado and jalapeno aioli. Tell me that doesn’t sound amazing.